Next fall, the German research icebreaker Polarstern will leave Tromsø and spend the winter drifting with Arctic sea ice. The largest international Arctic research project to be undertaken, the Multidisciplinary drifting Observatory for the Study of Arctic Climate (MOSAiC) project, was kick-started last week in the German capital of Berlin. Led by the Helmholtz Centre for Polar and Marine Research at the Alfred Wegener Institute, 600 people from 17 countries will participate in the expedition, while many more researchers will make use of the data acquired to reach the next level of climate and ecosystem research on the Arctic. “The knowledge derived from the MOSAiC expedition will significantly expedite our knowledge about the Arctic. We need this data urgently to improve our understanding of the effects of global climate change and our prediction capabilities,” Germany’s Federal Minister for Education and Research Anja Karliczek said during a recent press conference in Berlin. During the expedition, only the forces of nature will decide which route the Polarstern will take. During the drift, the icebreaker will be supported by icebreakers from Russia, China, and Sweden. “International cooperation is key for a project of this size”, Professor Antje Boetius, Director of the AWI, emphasizes. International cooperation will also manifest itself in form of several research camps on the ice, which will study ocean, ice, atmosphere, as well as the fauna of the Arctic winter. Research about conditions during the long, dark Arctic winter hardly exists due to the difficult accessibility of the region, especially during the six months of darkness of the polar night. The aim of MOSAiC is to develop a better understanding of the coupled system processes between atmosphere, ocean, and sea-ice, as well as how changes in these systems play out on international and regional scales. 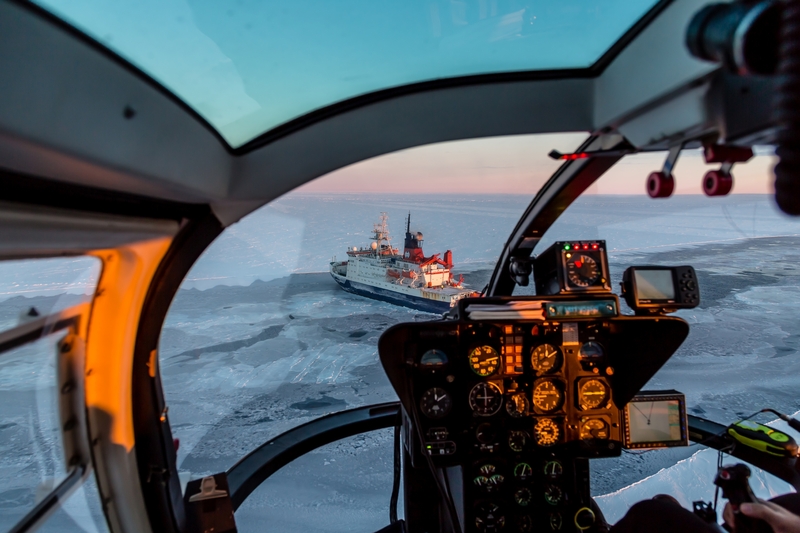 Five core areas of research will attend to this task: sea ice physics and snow cover, atmospheric and marine processes, biogeochemical cycles, and the Arctic ecosystem. The project budget covers more than €120 million, funded by the participating international partners and especially the Helmholtz Association and thus by the German Federal Ministry for Education and Research. A project of this scope requires a massive planning effort. The first steps were taken as early as back in 2011, and Polarstern will set out to sea just over a year from now. However, with the official launch, the critical preparation phase has now finally begun, and the countdown for the most spectacular Arctic expedition is on.